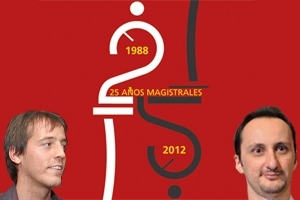 Two great tactical chess fighters V.Topalov and V.Pons will play a friendly rapid match in Spain 8-10.06.2012. Day 08 June 2012 Topalov – Vallejo 1st and 2nd Games. Day 09 June 2012 Topalov – Vallejo 3rd and 4th Games. Day 10 June 2012 Topalov – Vallejo 5th and 6th Games. Drawings lots will be place on 07 June at 20,00 hours. There will be 10 minutes break among the games. Each player will have 45 minutes+15 secons/move for the whole game. 3). In a match of a draw it will be decided by a match. The match will consist of two games with a time-control 5 minutes per player + 3 seconds for every move played. In case of another tied result – there will be played a last “sudden-death” decisive game with a time-control 6 minutes for the whole game for the White-player and 5 minutes for the whole game for Black-player. The White-player will only need a victory in this game to win the tournament, whole the Black-player will win the tournament by just not losing that final decisive game.